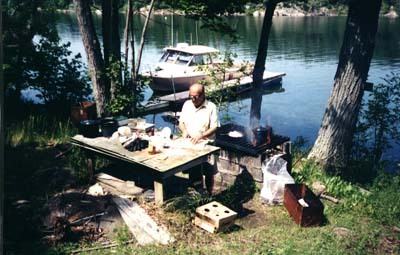 For decades, fishermen who visit the 1000 Islands region have enjoyed shore dinners as a traditional part of a day of fishing with a professional guide. In the early 1900s, river guides set forth with their parties each morning in their St. Lawrence Skiffs, rowed by their guide. They would have their shore dinners on any island that was convenient at lunchtime. Today, fishing guides ply the same waters and offer the very same shore dinner. The traditional Shore Dinner is included as an option on Full Day Private Charters. The shore dinner is quite a production, since everything is prepared from scratch, right before your eyes. Around noon the guide will call an end to the fishing and head to the guide's dinner grounds where the lunches are prepared. It is located on Grindstone Island at a small NYS park with a portion of the park reserved for the exclusive use of the guides and their guests. Shaded lunch sites are fitted out with picnic tables, work benches and a large fire place adequate for the number of guided parties the site can accommodate. After the fire is started and water put on to boil for coffee, potatoes and corn on the cob, the guide sets the table, complete with table cloth. First to hit the skillet is the sliced fat-back. Sliced thin, the fat-back resembles bacon with one obvious difference. Where bacon or salt pork have lean meat, fat-back is just that, 100% fat from the back of a pig, with no lean meat. The difference is important, at least to Clayton guides. As the fat renders, the residual lard is used to fry the fish and dessert. It is the one absolute necessity of the entire production. As the fat-back fries, it reduces in size by as much as 80%, as the rendering that will be used to cook the meal is created. When done, the morsels turn golden brown and crispy. A slice of bread is covered with thinly sliced onion, topped with three or four pieces of the fat-back, folded into a sandwich, and the appetizer is ready for tasting. Those who have never had such a thing usually only eat two or three. Those who know what they are getting usually use two slices of bread for a much larger and more traditional sandwich. While the anglers enjoy the appetizer and a freshly tossed salad, with 'Original' Thousand Island Dressing of course, the guide will dust their fish with breading and put it to fry in the super hot fat-back rendering. In seconds the fish is golden brown while the fresh coffee grounds that were dumped into boiling water have settled for more than 30 minutes, changing the river water into a true outdoor delight. The potatoes have been at boil for nearly 45 minutes and the fresh corn on the cob for ten. All comes to readiness at the same time. While the group digs into the freshest fish they have ever eaten and the corn and potatoes, the guide begins preparations for dessert. Eggs are broken into a bowl and sugar and cream are added. The batter is used for bread that has been drying in the sunlit breeze for about an hour. Thrust into the rolling hot fat-back grease, the batter immediately puffs up, making the french toast resemble the finest french puff pastry. The french toast is topped with butter, a bottle cap of maple syrup, a bottle cap of cream and bottle cap of brandy. All of this is topped off with the brew locally known as "guides coffee." Strong and dark, it is a necessity for those wishing to stay awake for the half hour ride back to the Clayton dock. The shore dinner is a gastronomic adventure. While far from what one might call a healthy meal, it is a delicious experience. Unfortunately, the menu is not changeable to accomodate alternative diets. Our shore dinners are $27.50 per person, assembled for preparation by our local catering service who follow the original menu with fresh local products, as available, and delivered to the boat prior to your arrival. You can plan on it replacing lunch and dinner that evening. You are responsible for your own canned or plastic bottled beverages, ice and moning snacks.